With debate ramping up about this week about which player currently stands atop hockey's thrown as "best in the world" after some incredible early-season performances, Maple Leafs head coach Mike Babcock's went with a tried and tested third option for his pick — Sidney Crosby. With debate ramping up this week about which player currently sits atop hockey's throne as "best in the world" after some incredible early-season performances, Maple Leafs head coach Mike Babcock went with a tried and tested third option for his pick — Sidney Crosby. "This is what I think," Babcock began as he made his case for the Penguins captain prior to Pittsburgh's stifling 3-0 victory over Toronto on Thursday. "I think one guy's got two Olympic gold medals and three Stanley Cups." McDavid, the captain of the Edmonton Oilers, owns back-to-back NHL scoring titles and has won the Hart Trophy as the league's most valuable player, while Matthews, the Leafs' deadly sniper, tops this season's points race with 16 in just eight games. McDavid and his blazing speed set an NHL record earlier this week by becoming the only player to either score or assist on the first nine goals of his team's campaign. On the other hand, Matthews and his lethal shot that often leaves an opposing goalie looking up at the replay for a glimpse at a puck that just whizzed into the top corner, is just the fifth player in league history to record seven straight multi-point games to start a season. Those accomplishments by the 21-year-old phenoms are nice, to be sure, but Babcock said personal accolades only matter so much. Crosby, 31, has been on top of the hockey world for the better part of the last decade, winning the Cup in 2009, 2016 and 2017 to go along with gold medals for Canada at the 2010 and 2014 Olympics. Had it not been for the concussions that saw him play just 63 of his team's 164 games between 2010 and 2012, the two-time Hart and Conn Smythe Trophy winner might own even more hardware. "I don't think he plans on giving anything away," Babcock said of Crosby, who he coached at both the Vancouver and Sochi Games, and again at the World Cup of Hockey in 2016, which Canada also won. "I saw McDavid play the other night ... he had four points and was an absolute star, but these guys have done it forever. "Team success in the end, that's how you're measured. When you've been the best player on the best team, to me that's totally different than being the best player on a team that's not as good. "As you've got people around you to raise your game and set a standard ... to me, it's not even close." Watch: Who has held the NHL's "best player" belt through the years? 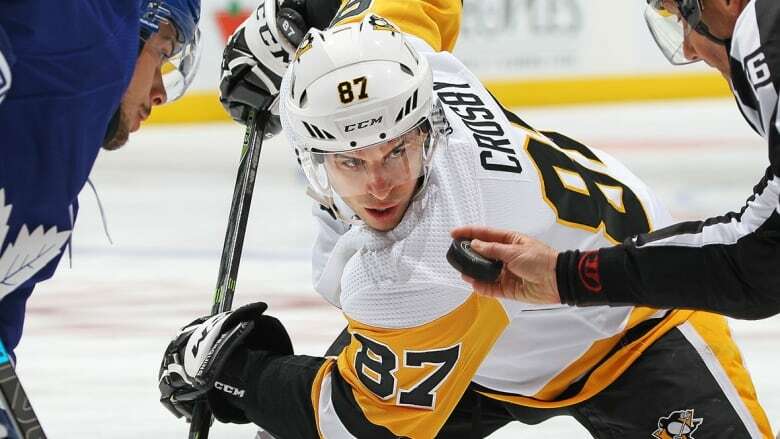 Penguins head coach Mike Sullivan took over behind Pittsburgh's bench partway through 2015-16 and immediately grew to appreciate what has kept Crosby at the top. "Sid's the most driven athlete I've ever been around," Sullivan said. "Not only is he an elite player, but he's willing to put the work in to continue to try be the best player he can be. I've grown so much respect and admiration for him over the years that I've been coaching him because I have the privilege of watching him on a daily basis put the work in to be the player that he is. "It's not by accident. He's a real accomplished player, he's deserving of all the accolades he's received." Leafs centre Nazem Kadri, who has had some well-documented battles with the Penguins star in the past, said it's tough to pick between Crosby, McDavid and Matthews. "I still think Sid's an incredible player and McDavid's definitely up there, (Matthews) is creeping up there," Kadri said. "There's definitely some players in that genre. "To me, McDavid's speed is just incredible and so hard to stop. You can't necessarily make a mistake when he's on the ice because when you're beside him you're going to be behind him." Leafs centre John Tavares, who went head-to-head with Crosby for nine seasons as a member of the New York Islanders, said his drive is what stands out. Crosby has five assists in six games this season playing on a line with Jake Guentzel and Bryan Rust — the first time in his career he's gone without a goal this long — but Sullivan said that has nothing to do with anything the player has done to this point to prepare. "He leaves no stone unturned," Sullivan said. "He takes care of himself physically. He trains so hard, both off the ice and on the ice. "We learn as much from Sid as I think he does from our coaching staff with just the way he thinks the game." So coach, is he still the best player in the world? "In my opinion, he is, yes."